The experts say that 85% of Christians accepted Jesus as their savior before the age of 18. Think about that, that means only 15% of the people who come to Christ come to him as an adult. If we really want to make a difference in our cities and neighborhoods then we need to do everything we can to reach our children for Christ. That seems to get harder and harder each passing year. 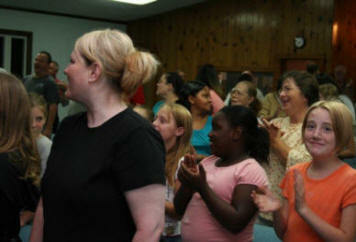 With millions of children growing older each day the possibilities of them coming to Christ grow smaller. How do we compete against the messages that our children are bombarded with everyday. From the movies to MTV, these are all influencing our children. It's frightening to think that we could lose this next generation. The good news is that God is still in control and He has provided us with instruments that we can use to reach our children…we just have to use them. 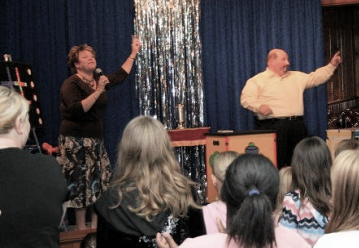 For over 27 years Terry and Cynthia has been ministering to and entertaining audiences of all ages. They are known for their powerful Children's Crusades where literally thousands of individual's lives have been transformed. Whether it's doing Family / Kid's Krusades, Upward Award programs or their "Can you Believe" program, Terry and Cynthia has the program that's right for you.